This recipe is adapted from a recipe I found in the NZ Home and Garden "Food, Friends and Fun" Magazine, which I took a quick flick through and just knew I had to have. 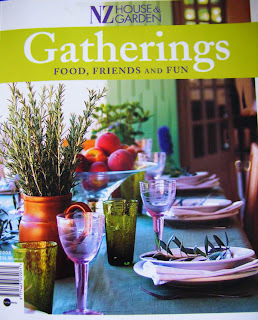 It is packed with excellent ideas both for cooking and decorating for occasions. 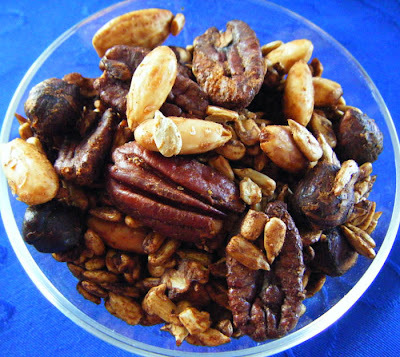 I had seen a recipe for spiced nuts inNigella Christmas: Food, Family, Friends, Festivities and thought it sounded lovely, but liked this one better as it had a lot less sugar and no oil. I will give the original recipe here (as it is made with pretzels as well) and then add my variations (there are, as always, a few). I made mine with nuts only and they turned out just beautifully. The slight amount of sugar is just enough to make them 'special', combined with the spices of course. I think they would make a lovely gift, wrapped up, or a nice thing to take along to a party. One thing though, my version would not be cheap to make. The recipe makes 4 cups (and I would recommend 1/4 c per serve) and the nuts cost about $9.00 all up (so each serve is approx 50c each). Okay occasionally -maybe only as a special treat however!!! Preheat oven to 180C. Line a swiss roll tin with baking paper. In a large bowl, whisk together egg white with sugar, then add cumin, salt, cayenne pepper and paprika. Add nuts and toss to coat. I used 1 tsp cumin, 1 tsp paprika, and 1/2 tsp cinnamon. combine all sorts of flavours. Oh I haven't seen that mag yet, Linda. Like I need another one, though!! Sorry to hear you have lost your blogging mojo. Sometimes life gets in the way, as I well know, and I don't think you should feel any pressure to blog. Summer is a time to relax and spend with the kids and family. Life is much more conducive to spending outside than in the kitchen. Will look forward to reading when you do post, otherwise enjoy the break. Perhaps you need to take a road trip to the Mt when I am there in the summer!! Sorry to read about losing your blogging mojo it happens to the best of us at times. I agree with deb and don't feel any pressure to blog.